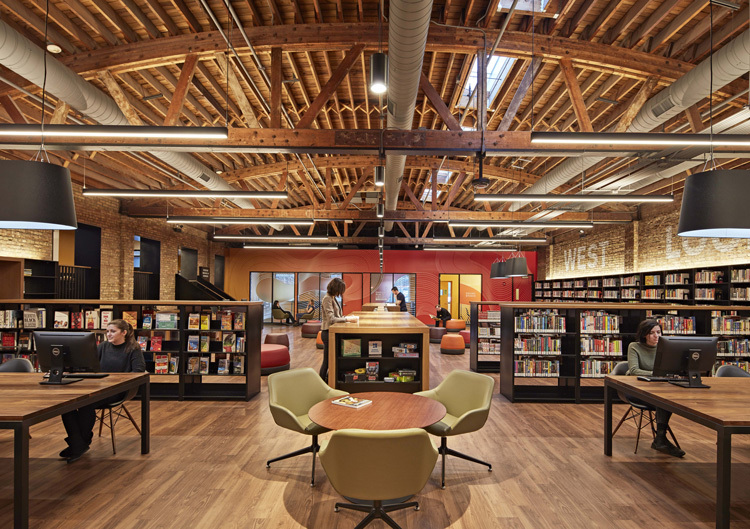 Chicago — On January 17, Chicago Mayor Rahm Emanuel and Chicago Public Library Commissioner Brian Bannon, with local civic and business leaders, inaugurated the Chicago Public Library, West Loop Branch, the first-ever public library in the neighborhood and the 81st branch for the city. Donated to the City of Chicago by developer Sterling Bay as part of the ongoing development and transformation of the West Loop, and designed by Skidmore, Owings & Merrill LLP (SOM), the two-story adaptive reuse project preserves the building’s industrial character while creating a new cultural and social center for the neighborhood. The new, 16,500-square-foot library includes several contemporary features, framed by a series of architectural and graphic interventions throughout the building. It includes adult and children’s reading spaces, flexible community and meeting rooms, and a YOUmedia teen digital learning space with a recording studio. A “Tinkering Lab” offers digital and maker space for younger children, who are also served by several early learning areas that transform existing alcoves into storytelling rooms with interactive play elements and walls with magnetic and writeable surfaces.